One among Central Florida’s largest u-pick blueberry farms, Ever After Farms, is going to be having a Wedding Barn Grand Opening and Bridal Expo on December 2, 2017 from 10AM to 1PM. Located just off of I-95 in the picturesque and peaceful farming community of Mims, Ever After Farms has long been a very popular pick your own blueberry farm for several years. After the blueberry season ended in June of this year, considerable changes were made to improve the blueberry picking experience as well as host weddings and on December 2nd, engaged partners are cordially invited to tour the rustic wedding venue, for free. At this occasion, couples can escape the hustle and bustle of city life and enter an undisturbed and attractive country environment. Meet Pat and Tom, the gentle giant Ever After Farms Clydesdales. 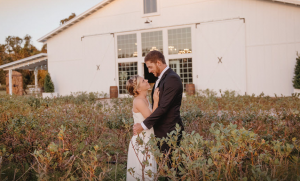 Tour the huge white colored barn that serves as both a blueberry farming area and can host marriage ceremonies about 200 people. Capture pictures beside a real-life Cinderella Carriage. Get some shade under the magnificent 120 year oak tree. It’s truly an inspiring experience for those that are trying to picture what an excellent rustic barn wedding venue looks like. More than merely a Grand Opening as a country wedding barn though, this event will additionally feature a Bridal Expo, in which greater than 26 wedding industry vendors will be set up inside the air-conditioned 7,000 sq ft barn, including bakers, florists, DJs, organizers, officiants, and many more. They are going to be giving information on their services and giving out exclusive prizes to those in attendance. Also to enter into the spirit of the season, there will even be a snow apparatus blasting snow over Xmas trees. Although admission is free of charge, interested couples will have to enroll for the event on their website.